McCrory, L. 2008. 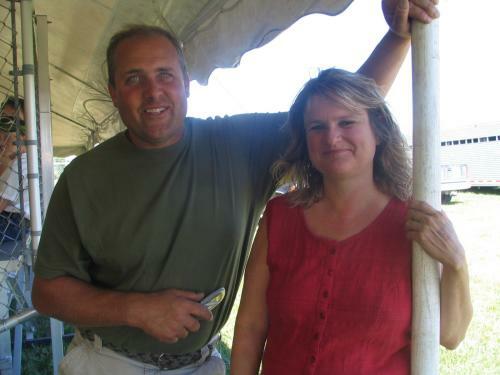 Feature Farm: Kimball Brook Farm, Cheryl and JD Devos, North Ferrisburg, VT. Northeast Organic Dairy Producers Alliance. Vol. 8, No. 1: 22-27. (Available online at: http://www.nodpa.com/newsletters/Jan2008.pdf) (verified 21 Jan 2009). Cheryl and JD Devos are one of Vermont's largest organic dairy farms, milking a total of 225 dairy cows year round and farming 965 acres in North Ferrisburg, Vermont. Their farm has been in JD's family since 1968 and has been under Cheryl and JD's ownership and management since 1997. They rent about 425 acres and own 540 acres, which include two farms: one for the dairy herd and a second providing pasture and housing for the heifers and dry cows. Almost 300 acres is used for pasture for the cows and heifers. They grow about 120 acres of corn silage, 380 acres are in hay production and 100 acres are forest land. JD and Cheryl Devos of Kimball Brook Farm. Photo credit: Robin Reid. Many of the cows on Kimball Brook Farm are descendants of cows brought from Monroe, New York where JD's grandfather started a farm in the early 1950's. Most cows are grade Holsteins but 10% of the herd are Jersey/Holstein crosses and 5% are Jerseys. The crosses and Jersey cows have come into the herd upon the farm's transition to organic production in 2004. To avoid possible calving difficulties with their first calf heifers, JD and Cheryl decided to breed to Jersey bulls for easier calving. They use a bull when the heifers are out on pasture and A.I. in the wintertime. Their transition to organic was well planned and took three years, as much of their land needed to transition for the full three years. Initially, their reason for pursuing organic certification was purely financial due to the low conventional milk price and the frustration of not being able to pay some of their bills. In the Fall of 2003, Cheryl attended a workshop offered by the Northeast Organic Farming Association of Vermont (NOFA-VT) on transitioning to organic dairy production. After that meeting, Cheryl knew that they should go organic. She then convinced her husband and together they put together a business plan to present to the bank for approval prior to spring planting. Cheryl and JD started shipping milk to Horizon Organic in May of 2005. Production per cow averages 18,000 pounds per year. They have used Dairy Herd Improvement Association (DHIA) record keeping for the past eight years as a tool to both monitor individual Somatic Cell Count (SCC) and help with culling decisions. They hope to add some additional record keeping and monitoring to help assess the effectiveness of their herd health management, such as cases of metritis and its relationship to ongoing reproductive health post treatment. Last year, they had enough surplus cattle to sell 25 milking cows and heifers. In the past, they have sold at least ten dairy animals each year. They feel they are keeping their cows longer now and see the additional income potential of selling surplus organic dairy stock. The cows are housed in a freestall barn and have access to pasture during the day from May to November. Dry cows and heifers six months of age and over have freestall housing at a second farm adjacent to the home farm. During the grazing season (May to November), these groups of animals are on pasture 24 hours a day. Heifers 3-6 months of age are kept in a bedded pack located at the dry cow/heifer barn and calves from birth to weaning are raised in individual pens. Calves (ranging from three to five months old) are weaned when Cheryl runs out of room in the individual pens. When calves are getting ready to wean, Cheryl removes some of the dividers, turning the pens into double occupancy pens. This allows the calves to socialize and go through the weaning process with a pal. It also prepares them for the dynamics of living in a larger group when they transition to the bedded pack. Over the last four years, Cheryl and JD have worked with USDA Natural Resources Conservation Service (NRCS) and the Vermont Agency of Agriculture to develop fencing, laneways, water systems, and grazing plans on their two farms. By enrolling in the Conservation Reserve Enhancement Program (CREP) and Environmental Quality Incentives Program (EQIP), they received 70 to 90 percent cost shares, making these improvements more affordable. In exchange for the cost share assistance, they agreed to fence out 50 feet on either side of a large brook that travels through their property as well as taking some pastures out of production that were prone to flooding and planting trees in some of the wetter areas. The fencing project was completed for the dairy cows on the home farm first and then they developed the pasture infrastructure for the heifers and dry cows on the adjacent farm. They use high tensile perimeter wire with single strand divider fences and water tubs in each pasture. During their third year of grazing, they felt as if they were really getting the hang of their pasture system and stopped supplementing the heifers with round bales. Now the older heifers survive on pasture alone from May to November; they are kept with a bull and are rotated onto new pasture at least once a week. Heifers six to twelve months of age are just learning how to graze, so they are placed in paddocks where they have the ability to come back to the barn twice a day to get grain. This also gives Cheryl the opportunity to see these heifers regularly and make sure that they are growing well and learning how to graze. The milk cows are moved to new pasture daily but do not graze at night. Cheryl and JD found it too challenging to move the cows in the darkness of early morning. To complement the pasture, the cows are fed a total mixed ration (TMR) consisting of corn silage, haylage and grain. Developing a rotational grazing system has made a large difference to their pastures and herd health. Cows on pasture are healthier and have muscle tone, contributing to overall health and longevity. They see new clover growth in their pastures now and rely less on stored feeds. And, they enjoy seeing some of their younger dairy cows galloping back to the barn at milking time. Cheryl and JD have been very happy with their milk quality, which averages 130,000 SCC. To maintain high quality milk, they use a quarter-milker on the high count cows. The milk from the quarter-milkers gets pasteurized and fed to calves. For udder prep, they use iodine for pre- and post-dipping and make sure that the udders are very clean. All animals are fed kelp mixed into their grain or TMR as a preventative treatment and nutritional supplement. When dry cows are close to calving, they are moved to a freshening pen in the heifer barn until they calve. Cheryl makes sure that the calf nurses the cow or is fed colostrum right away. The cow stays with the calf for three to five days and she doesn't milk out the cow at all, letting the calf do the work. This gives Cheryl a chance to watch the cow, making sure she is eating well, is clean, and getting any attention she may need. If the calf is not drinking, Cheryl will milk the cow and give the calf her milk using a bottle or tube. Many potential cow and calf problems have been prevented since this routine was implemented. At birth, all heifers get a Poly Serum (blood serum vaccination) and are dipped with iodine. At weaning, they are given a shot of Bovishield and then given a booster (oen to two months apart) before going outside to the freestall at six months of age. All calves six months and older receive another shot of Bovishield and Pink Eye vaccinations in the spring before going out to pasture. Once the cow is moved to the dairy barn and fed a TMR, they are no longer able to monitor her intake. To monitor fresh cows, they take their temperatures at milking time until they see consistent normal temperatures. If JD and Cheryl see an abnormal temperature, they call their veternarian right away. For metritis, they infuse the cow with hydrogen peroxide at 120 cc's every two days. Their veternarian checks on the cow once a week until she is well. This treatment has been so successful that their vet is now using it with conventional clients too. For a retained placenta, they use a calcium electrolyte within eight to ten hours after calving. They have used aloe and garlic but this treatment wasn't working for them. They treat pneumonia with aloe, garlic and Poly Serum (75 cc's for a calf, 100 cc's for a cow) which works well if the pneumonia is caught early. As a last resort, they will turn to antibiotics and remove the animal from the herd (this is rare). For calf scours, they use a Crystal Creek product called Bright Star, electrolytes, aloe and garlic, and yogurt. They have found that the biggest preventative for scours is making sure the calves get colostrum right after birth. They've found that these calves are also more likely to survive a calf scour episode later in life. Mastitis cases are rare, but when one crops up, they use Crypto-Whey from Crystal Creek, and Udder Comfort massaged into the udder. For a really hard quarter, they put aloe in the quarter. Cheryl tries to attend one or two workshops per year to stay current. Books she turns to when she needs to look up a case or determine an effective treatment include Dr. Karreman's "Treating Dairy Cows Naturally" and Dr. Detloff's "Alternative Treatments for Ruminant Animals." She feels her veterinarian, Dr. Kent Anderson, is a great support; he encourages high forage rations and has been actively learning about organically approved treatments and management practices. The practice for which Dr. Anderson works (Valley Wide Veterinary Practice) is considering stocking Dr. Karreman's products at the office and on the truck. Cheryl and JD struggle to maintain the herd size they need to address their debt load while having enough pasture for their dairy cows to comfortably meet the recommended 30% dry matter standard. Their ideal would be to milk fewer cows but that's not possible right now due to debt service. An opportunity to increase their pasture by 50 acres failed when they were outbid on a neighboring piece of land that came up for sale. Unfortunately, the pay price for milk is not keeping up with the price of grain, fuel and other fixed prices; they saw cost of sawdust alone increase by 50% in just one year. Cheryl and JD agree that a 20% increase in pay price needs to happen. After two and one-half years of shipping organic milk, Cheryl says that being organic is not about the money any longer. "It changes your whole head about things," she said. They've changed their purchasing habits; the majority of their groceries are now organic. And, they think a lot more about the impact of their decisions and the affect on the environment. Cheryl has even switched political parties (we will leave the readers guessing which way the pendulum swung on that one). Cow and calf at Kimball Brook Farm. Photo credit: Robin Reid. McCrory, L. 2008. Feature Farm: Kimball Brook Farm, Cheryl and JD Devos, North Ferrisburg, VT. Northeast Organic Dairy Producers Alliance. Vol. 8, No. 1: 22–27. (Available online at: http://www.nodpa.com/newsletters/Jan2008.pdf) (verified 20 March 2010).